•The place is really charming, near all commodities but still in a quiet place. •The owners are really nice person, Marilyne accepted to change my room when we arrived as we preferred not being on the ground floor. She also spoke French with me what is a nice attention, and her husband was always in a good mood. •We had a lovely terrace above our room to enjoy the sunrise and time spent relaxing time around the swimming pool. •The room was cleaned every day. The best vacation on the best island with the Best hotel! The owner Vasilli, his wife and staff are very kind and friendly! We enjoyed drinking wine and having conversations with Vasilli (big and warm greetings from Austria!). The hotel is very close to the beach and to the very good restaurant The Volcano, also its close to the bus stop and shops. The room was very clean ! Thank you for the great experience! Owner was very very welcoming and made sure my friend and i were comfortable and answered any questions we had extremely well. Pool was nice and The best was so close to the beach and restaurants which was very handy. The staff were fantastic and the accomodation in a great location. Everyrhing very nice..beautiful hotel, location perfect..hosts very kind..high recomanded this place.. The staff are incredibly kind and accommodating and wonderful. They made us feel welcome and at home. We loved it!! Very friendly and welcoming, gave advice about where to go and always on hand to help, Maria kept the room clean. Comfy bed. Great location next to bus stop and close to the beach. Great grill bar opposite with home cooked food and 24 hr bakery opposite too. Stored luggage on last day as late flight. Thanks for a lovely stay Vas and Marilyn. We will return. Lock in a great price for The Best – rated 8.5 by recent guests! The Best This rating is a reflection of how the property compares to the industry standard when it comes to price, facilities and services available. It's based on a self-evaluation by the property. Use this rating to help choose your stay! 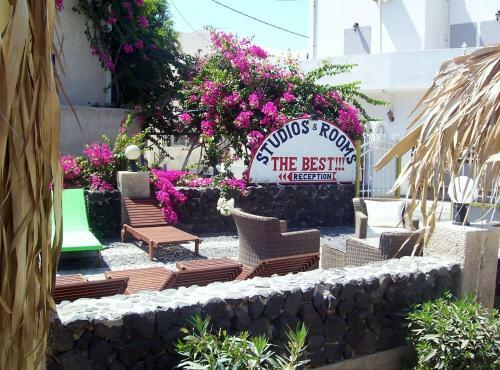 Excellently located, close to Perissa’s black beach and just 350 feet from the village center, The Best Suites provides self-catering accommodations, close to public transport links. The Best Suites have a variety of fully equipped suites and apartments to suit your needs. Each bed is fitted with an orthopedic mattress to shape your body for a comfortable night’s sleep. You can rent a laptop and order in-house movies from the staff. During the summer season, the fresh seawater pool is the perfect place to relax and refresh and you can also enjoy a cocktail from the pool bar. The bus stop is just 150 feet from The Best Suites and busses regularly run to other parts of the island until late at night. With Watermania Park and Perissa’s shops and tavernas just a short walk away, these suites are a good base for your holiday. When would you like to stay at The Best? Tastefully furnished room with double glazed windows. This apartment has 2 separate bedrooms and bathrooms and a small kitchenette. This quadruple room features a balcony, private entrance and electric kettle. House Rules The Best takes special requests – add in the next step! The Best accepts these cards and reserves the right to temporarily hold an amount prior to arrival. The hotel serves a cold buffet breakfast or a continental breakfast in the room. Please inform The Best of your expected arrival time in advance. You can use the Special Requests box when booking, or contact the property directly using the contact details in your confirmation. Went in December and pool was slimy green. Walkable to beach and restaurants. Lovely staff. Except there was weak water pressure in shower and barely any hot water. The best is situated near a bus stop which is good, but the bus never runs on time and doesn't come very often. The Bathroom had a lot of mould everywhere, so much you could smell it which wasn't pleasant at all. WiFi did not work well unless you were by the pool. Lovely staff, great location and cosy rooms.